Hello my dear Lucky Mojo family! I have gotten into a somewhat sticky situation and need everyone's advice. I am a stage performer, very popular within a somewhat closed yet very large community. I rarely market my talent outside of that community, because they are very conservative and have very specific cultural demands. Maintaining a certain image is a capstone of success at my job. A few days ago, my lookalike went on national television under my name and made a complete fool of herself in front of millions of people. As it turns out, not only does she look like me and shares my name, she also tries to market herself under a very similar stage alias and branch out into the same business that I am in. Long story short, I just want to avoid negative attention and remain in business. Does anyone have any advice on how to deal with this situation? I don't want to hurt the girl; she's clearly delusional and wants any attention she can get. I don't want to be confused with her. Thank you St. Anthony, St. Expedite. 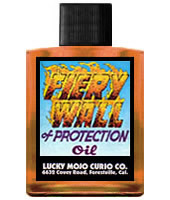 When you feel that someone is attaching you ariela, I recommend Fiery Wall of Protection (http://www.luckymojo.com/fierywall.html)...as the caption says, ...it is the best answer to malicious spells directed against you and your loved ones -- and it also puts up a powerful shield against gossiping co-workers or jealous rivals. It is not intended to create harm, only to give protection, thus it is safely used by folks who want to keep their 'karma' pure." Uncrossing and Fiery Wall of Protection should prevent most work aimed at you. A 13-herb bath is a good idea also. I have a somewhat public job -- I autograph things, I sign a lot of contracts, I sign photographs, basically I sign like hundreds of things a year for total strangers. No choice but to do this if I want to keep my job, and no option to change my name or do anything too fancy in the signature. I could possibly do a small sigil/symbol type thing, if anyone thinks that might help. Does anyone have any ideas on how I might protect myself (or protect the signatures, depending on how you look at it) from possible use as personal concerns? I haven't had any problems yet, but I'm concerned. I feel OK about dealing with work on a case by case basis if/when it comes up, but of course I'd rather not get to that point--I'd rather stay protected to being with. This sounds like a tricky situation. Perhaps doing a Fiery Wall of Protection spell for yourself will help. Or perhaps you should contact a Rootworker to do a spell to make your name unusuable as personal concerns by others. A spell like that is exactly what I has hoping for! Something to make my signature unusable as a personal concern. If anyone knows one, I'd be grateful (nothing against hiring someone, but I like to do my own work whenever possible -- even if I fail I learn something.) If not I'll give the FP a try, good idea. Thank you! The answer is simple, enchant the pen you use. 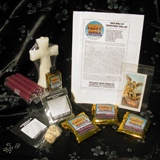 On a Sunday draw a cross on the altar with a mix of Reversing and Fiery Wall of Protection or Protection sachet powders. Set a small white candle dressed with Protection/Fiery Wall of Protection oils at each of the four points. In the middle of the cross set an incense pot. Set a mix of Agrimony herb and either Protection or Fiery Wall of Protection incenses powders to burn in it. Hold the pen in the smoke and call out your prayer that no signature of yours made with this pen can be used against you, that any magic sent at you that way is stopped up and reversed. Pray your favorite verse or psalm of protection as well. Then take some of the same oils you used to dress the candles and lightly dress the inside of the pen. That is to say, take the pen apart and lightly dress the ink cartridge with the oil, then put it back in the pen. Use that pen only for writing your signature. When it runs dry either throw it into the crossroads or, if its a nice pen, replace the ink cartage and repeat the spell. An enchanted pen! I love it! This could help in MANY different situations. Thanks for sharing Turnsteel. I can see this being used in a number of ways. An artist's fixed pens, brushes, ect. Money drawing, general attraction, steady work, or whatever is needed at the time. Especially cool spell Turnsteel. Really portable. I draw on the spot and it can be difficult to put herbs, oils, and curios in an ink drawing. A painting is a different story. Thanks for this one. My head is spinning a bit with the possibilities. That is extremely cool, thanks so much --that's a great idea, and I will use it whenever possible (and like everyone else here my head is spinning with a million cool possible variations--adding money drawing oil to a contract-signing pen, for example). I'm still hoping to find spell that offers blanket protection from my signature (and photos, which I didn't mention before, and should have, and all other personal concerns) from being used in spellwork. Maybe FWP is my best bet. I was hoping to find a specific spell for this purpose. Thank you! Enchant ALL THE PENS ON YOUR DESK. If you can do so without being noticed, just take them home with you to work the spell described above, a fistful at a time. (If they're disposable stick pens, like Bic or Write Bros., you won't be able to take them apart; just dress the outside with a tiny quantity of the oil.) You can keep the work going by dressing your hands with FWP at work and praying over all your pens. The enchanting of the pens is a great idea. If you are looking to do a spell to remove the power of your name is another thing altogether. You should have a consultation with a rootworker on this. A spell to not only render your signature useless to others, but also any attempt to use your name in a spell. You might even go to the length of "disenchanting" all your personal concerns by use of others. A very powerful form of protection. Thanks so much Apollo. Now that I think about it, I realize that's exactly what I want/need -- a spell to make all my personal concerns unusable. Maybe I'll try a protection or FWP spell on my actual signature to protect the hundreds that are already out there, and protect future ones. (Enchanted pen sounds great, but I already have hundreds of signatures out there). Thanks for the good idea. Now that I think about it, maybe I'll set up a whole little protection mini-altar with my signature, press stuff, etc. (and could load up my pens there too). And as for photos -- I've seen other folks ask here about how to protect their photos, but I've never seen an answer--so maybe there is no way to do so? I could cast spells on the pictures I put out myself, but how to protect pictures others take (again, that's part of my job, or I would never allow it)?? Maybe just improvise a spell for protecting photos? Anyone ever try anything like that? ANyone know how famous people deal with this? Probably I'll end up needing to consult a rootworker as you advise but it's more fun to try to figure it out myself. Thanks again! Sounds like you have a good idea where to start. A Consultation is also a great idea for that extra help. An altar specifically for your protection is probably the best bet. There a number of things that pop into my mind that can be done for this, such as a loaded picture of yourself put into a frame. The old Picture Frame spell that was taught to me by Miss cat. I like this post! I think the advice given above is great too! I would consider doing a "signature stamp". They have to have an original to make the stamp. You can "smoke the signature". I like The Firey Wall of Protection. Check into everything protective. Also, if you look at my picture on the Lucky Mojo Hoodoo Rootwork Hour, you can actuallly see Spirit. Look inside the black background. There are magical workings, and prayers that were done to that photo which is why I do not mind that it is out there. I will not reveal what I did. I can't but you are on the right track ! How can someone traditionally protect his/her name or birthday against spells or cast? You can protect your name, pic, birthday from harm. There are many many books that can teach you how to protect yourself. Cleansing yourself and your home is vital for protection. It is best to read and study about protection to figure out which is best for you. Many practitioners use a sigil after signing their name for protection. I'm sure that others will also have advice for this. but the question is "how you can seal/protect somebody to be witched by hiding their name/picture/bday under something"
I would have to disagree with your statement about the real full name, birthdate, etc. The spells would still work but, they would be weaker. There's ways of getting around this. As far as your last question, again, you would have to read the books that were suggested to you. Take the time to browse the forum and lucky mojo webpages on protection. And on spell casting. once again i would like to say thanks for great opinions,suggestions,advice and ideas ! There are such wonderful ideas here. I'm learning so much and I thank you all. I just had another idea, in addition to enchanting the actual pen you use. To give it a little more bang maybe, you could write out a petition for the pen (and write it with the actual pen), then 5-spot the petition with the appropriate protective oil and finish by either rolling or folding the petition around the ink cartridge and reinserting it. Just another idea, but I would love to hear what others think about it. Thanks Miss Cat! My mind is spinning with ideas! This may be a little awkward for folks who sign papers where others can see. But I work from home, so no document I sign leaves the house without a light dusting of Fiery Wall of Protection powder. Genies_Lamp wrote: There are such wonderful ideas here. I'm learning so much and I thank you all. I just had another idea, in addition to enchanting the actual pen you use. To give it a little more bang maybe, you could write out a petition for the pen (and write it with the actual pen), then 5-spot the petition with the appropriate protective oil and finish by either rolling or folding the petition around the ink cartridge and reinserting it. Just another idea, but I would love to hear what others think about it. I created a pen like the one I mentioned above to see how it would work and thought I would update you. I did not create it for protection, however. I created it to strongly influence everything I used it for with Road Opening, Fast Luck, and Crown of Success. First, I wrote out my petition using the pen I was going to enchant, 5-spotted it with said oils and inserted it to the pen. I also rubbed a tiny bit of oils on the cartridge itself, while praying. I had to kind of fold the petition around the cartridge to make it fit properly, but I felt good about it. I then anointed 3 small candles with the oils and arranged them in a triangle shape around the pen. I prayed my petition again as I lit the candles and let them burn down. I feel like it's working quite well. I use the magical pen for all of the petitions I write to give a little oomph. I have also used it to fill out some medical forms, which have so far turned out favorably for me. If you are interested in this type of work I encourage you to give it a try. It seems there are a great many possibilities. Thanks again for everyone's ideas and expertise! Now I want to try something: use ink mixed with whatever oil I want to use. I am also thinking that those old fashioned pens would work (the kind that you add the ink to). Now, you've got me thinking!! Thanks for the ideas and the motivation!! How does one protect their picture that is on Facebook or online from magical spell? Is there a way to do this besides, doing a fiery wall of protection, cleansing baths, etc...I read people put a sigil? Wasn't sure what that meant and which specific sigil. For instance, would you put a watermark on your online photos with a sigil for protection? Any suggestions or input would be greatly appreciated! And, yes, you can definitely work with the sigil on it. That's a terrific idea! You n also take that identical picture that is posted and work protection around that one. Thank you again Miss Aida! You are always so helpful! This is an old thread, but I recently ran into a couple of ideas for protecting your birthdate and photo. I got these from a friend who asked me not to mention his name. Take a selfie in a mirror to use as your facebook photo. It's backwards. That is powerful reversing magic. If possible put your birth date on facebook in "European" style. Americans write the month first, then the day, then the year. Europeans put the day first, then the month, then the year. Our Feb 4 is 2/4/18 but they would write that as 4/2/18 (which we would read as Apr. 2). It only works if your day and month are not the same (4/4/18 cannot be reversed) and if you are born on a day with a number of 12 or lower. But when it does work out, it is a powerful form of reversing magic. Also embed a watermark of a protective sigil in your online pictures. This watermark can be so subtle and so faint it's almost invisible. I once saw a picture of a prominent Pakistani politician shaking hands with Anwar Sadat. Incredibly, his necktie design consisted of a suble interlocking swastikas! These were the good, protective kind, not the ugly Nazi kind. Dress your surroundings in the photo with whatever you like to use for protection or invisibility -- Bay leaves, a dusting of Arrowroot powder, Protection powder, Fiery wall of Protection powder, Law Keep Away powder, or whatever suits your personal needs. This will not show up in the photo, but the power will be conveyed when the picture is snapped.